For skincare, I’ve already mentioned my love for the Oskia Restoration Oil which works perfectly alongside my current skincare regime for an extra boost of hydration and radiance. It’s definitely a pricier product, but I love it so much and little goes a really long way. I can see this little bottle lasting ages! I apply a little before bed in between my toner and night cream, and let it sink in. My skin drinks up the oil really quickly because it’s light and not at all greasy, making it the perfect combination for me. Makeup wise, there have been both new and old discoveries. 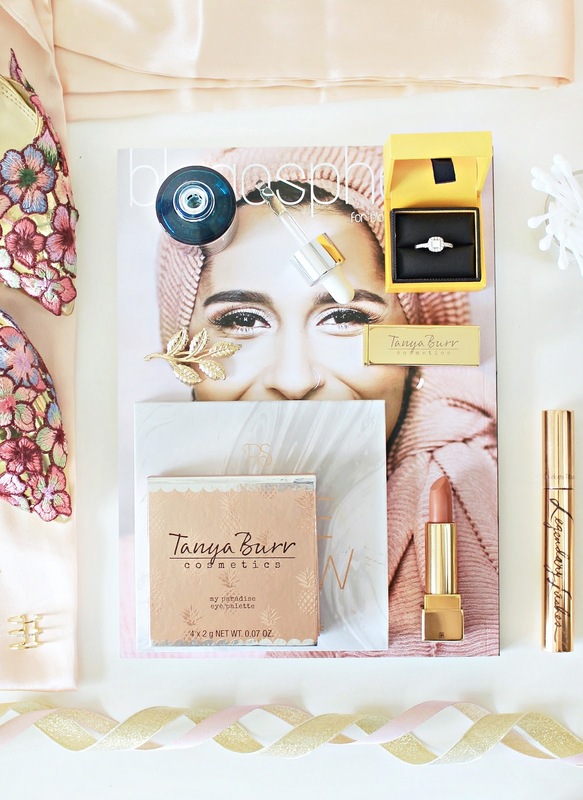 Firstly, you might have read my review of the new Tanya Burr Cosmetics Neutral Ambiance Collection which I am totally smitten with. I’m actually going to feature both of the products that I’ve tried in this months favourites because I’ve been using them non-stop since they were delivered! The eyeshadow quad in My Paradise is adorable, especially if you love rose gold – the shades are pigmented and very pretty for summer. 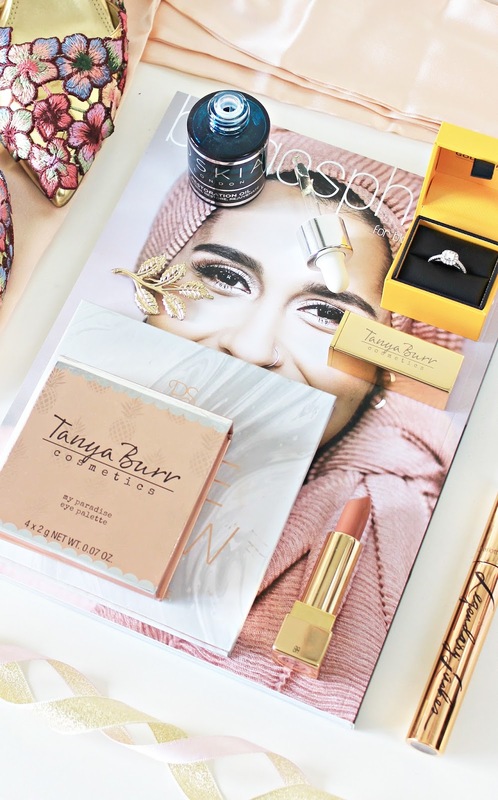 I also love the Tanya’s new lipstick in Bear Hug, the perfect addition to my neutral lipstick collection, and I’ve been wearing that every day since I got it too. I’ll link my full review and swatches of the collection here. Another new purchase has been the P.S… Pure Glow Kit. For starters, the packaging is marble. That sort of won me over in a heartbeat. Then the shades themselves vary from icy white to a beautiful gilded gold. It’s a lighter version of the Bronze & Glow Kit I reviewed last month, and it’s perfect for light to medium skin tones. The formula is velvety and the swatches are incredibly pigmented and beautiful, and I know I’ll be using this palette a lot this year! An old rediscovery is the Charlotte Tilbury Legendary Lashes Mascara which I’ve repurchased after remembering how much I loved it last year. It creates perfect evening lashes with lots of volume and length, so it’s definitely a great all round mascara. It is a little bit more of a pain to take off, but that means that it wears really well without flaking throughout the day! I’ve been reading several beauty and lifestyle content recently, and one of my favourite things to read is the Blogosphere Magazine which I finally subscribed to last month. I think it’s the perfect read for bloggers and anyone interested in reading them. It’s easy to read, with gorgeous images and interesting interviews and personal stories from other bloggers. I think it’s well worth subscribing to, and I’m so excited for the next issue that’s coming out! A couple of fashion favourites – these ASOS pointed flats are super gorgeous and I’ve loved wearing them this past month! They do rub the back of my ankle so I did have to purchase some soft sole stickers to make them more comfortable to wear, but they were just too beautiful to send back. They’ve actually sold out but I’ve linked another beautiful pair which are the most similar style I could find. I’ve also been loving my Weekend Vibes Sweatshirt on colder drizzly days. It’s such a cosy, easy-to-wear style that was a total steal. Of course, a huge favourite (and stress) of this month, and the next few months, is wedding planning. My beautiful ring has been a huge favourite – it’s very special and sometimes I find myself just staring at the sparkles. In case any of you were wondering, it’s this one from Goldsmiths. They were very helpful with the resizing issues and I’m very grateful for such a stunning piece from them. I was super excited to share the news with you all earlier this month, and now that the cat is out of the bag, I can think about writing a couple of wedding planning/beauty related posts. Let me know if you have any suggestions! What have you been loving throughout May? Previous Post Two Treats From Oskia.